He was a nervous wreck. We had two more days before receiving his report card — and my son couldn’t stop worrying about his grades. To be fair, we hold him to a high standard. He’s one of the few kids who gets straight A’s every quarter. But, when it’s time for report cards to be released, he gets stressed-out about it. The problem with this picture is that, at this point, with report cards being finalized, he is worrying about the past. He can’t change it. But he can learn from it and do better in the future. Report cards tell us what has happened. Earnings reports for corporations work the same way, and they are released four times a year. They tell us what a company has already done, with some comments on future expectations. This reality has created a unique situation for the market in the first quarter of this year, and it’s setting up for even more profits in the second quarter. Since the start of this year, earnings expectations over the quarter have plunged 7.2%. As that was happening — and analysts were lowering expectations for companies in the S&P 500 Index — the stock market was ripping higher, starting with a 15% gain in three months. 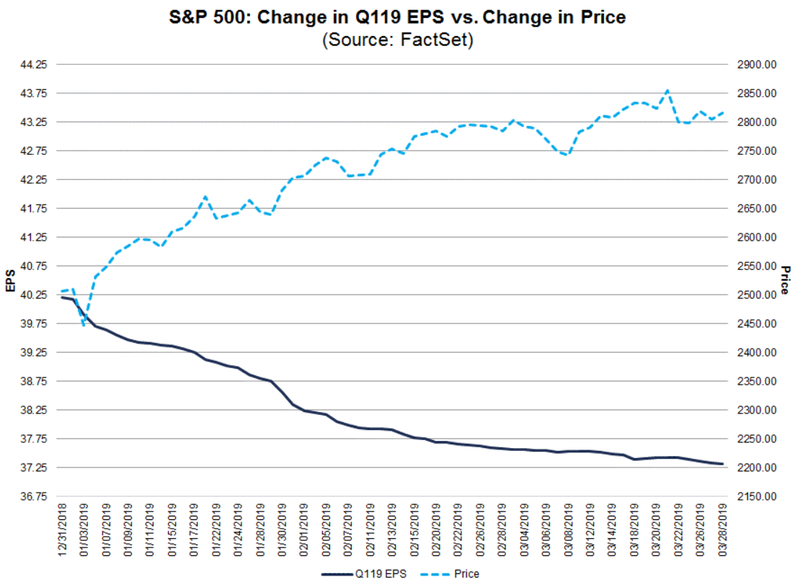 The S&P 500 (the blue dotted line) surged over the first three months, while estimates for earnings (the black line) plummeted. The bullish reaction in the stock market to these weaker expectations caught many off guard. After all, if you were counting on trade wars and the extended government shutdown to have an impact on the weakest quarter of the year, then you might have missed out on this rally. At this point, you may even be thinking that going short — as we get into the heart of earnings season — is a way to benefit from this divergence. It’s really a simple concept. Just as my son’s report cards are the history of what has already happened, an earnings report is looking backward. We already know the first quarter was weak. That’s why expectations have been declining throughout the quarter. The divergence happens because the stock market isn’t looking backward. It’s looking at what’s to come. And the rest of the year has a positive outlook. China trade tensions have eased. The Federal Reserve has paused interest rate hikes. First quarter gross domestic product expectations have steadily climbed higher. And, as I mentioned last week, the third year in a president’s first term is the one to count on for above average returns. This is what the market focuses on. As an investor, you want a strategy that also looks forward. To learn more about how earnings can have an impact on the direction of the stock market, watch my video below. Or click here to be redirected to the video. One of my premium services is designed directly around this concept. A forward-looking strategy based on earnings. In short, we don’t bet on a company prior to the release of its earnings report. When I developed the system, I understood earnings were backward-looking. Trying to predict what they will report, what the executives would say and how the market would react was extremely difficult. But predicting the new direction for the stocks’ prices was much easier, and it’s generated consistent triple-digit gains each quarter. My service is built around earnings because they are an extremely important event for a company. For my son, his report card is how we stay updated with his progress throughout the year. We can see whether he is meeting expectations or not. Regardless of what he gets on his last report card — after receiving that information — he can turn it around in the current quarter and improve his performance. Companies take the same approach. If sales were under expectations in the first quarter, the company’s management may go on a conference call to ramp up marketing, and get sales back in line for full year estimates. Or they could say the market is too challenging, and they’ll have to lower guidance for the rest of the year. This is the outlook for the future, and it’s what analysts focus on in earnings reports. These are the critical decisions that are forward-looking and will have major implications for the company’s stock. Those decisions will drive prices up once a company’s earnings reports are released. It is a key factor I have built into my Quick Hit Profits service. As we approach the upcoming earnings season, this strategy will position us to profit from a volatile earnings season — without buying a stock before earnings are announced. If you want to learn more about the best way to profit from earnings season, click here. And don’t forget to check out my new YouTube channel. Just click here, and hit the subscribe button to be notified when I post a new video. P.S. To checkout my YouTube channel, click here, and hit the subscribe button to be notified when I post new content.